Overdrawn at the Exposure Bank: MLS Cup Prediction Thread. Or Why Now Are We Tempting Fate? MLS Cup Prediction Thread. Or Why Now Are We Tempting Fate? What other tricks might the Maestro have in store for MLS Cup? This site hasn't done prediction threads with any regularity since the events of the summer when our cat collective lost our most vocal participant with her thoughts about matches. So on the eve of MLS Cup with the Portland Timbers facing Atlanta United in their home park under rather steep odds, why start now? Atlanta United have been setting records all year in terms of attendance numbers and offensive numbers, and most prognosticators have been anointing them as the team to beat since the early stages of 2018. Atlanta has Plittle to disappoint, rampaging through the end of the regular season and playoffs with little to no opposition with a scrappy Timbers side being the only thing standing between them and this year's MLS Cup. With the odds stacked so decidedly in one direction versus the other, it seems as though the match tomorrow is just a formality for Atlanta United. The thing is, this stretch run for the Portland Timbers has been fighting against the odds for months, and honestly speaking, if there was a side that could upend this party, Portland is exactly the right candidate for the job. Consider their run to the postseason. Portland started the season with 3 losses and 2 draws in their first five matches on the road before playing their first home match; while the win versus Minnesota was a victory, the Timbers struggled to overcome their own struggles and held on tight for the results. Over the subsequent months, Portland put together a 13 match unbeaten run to help stem the early season struggles, but a 4 match losing streak in August brought up the same early questions about whether Portland had the components to succeed long term. It's been a season long adjustment for the team under new coach Gio Savarese, who took over the side this year after Caleb Porter left unexpectedly after the 2017 season. The up and down results continued through September until the result that many said gave the Timbers the confidence that they could beat anybody at any point - a 4 to 1 win in Salt Lake City over Real Salt Lake on October 6. 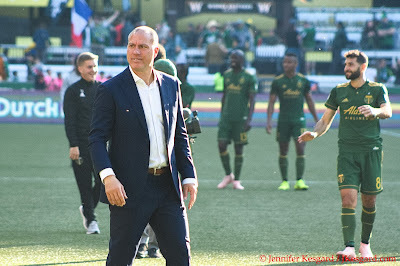 RSL and Rio Tinto Stadium has traditionally been a tough place for the Timbers to get results over the years, so overcoming all of that seemed like a really good indication that Savarese had his team in the right mindset. The Timbers followed it up with another win versus RSL at home, and a well played loss to Vancouver in the season finale using most of their young players. The results got the Timbers into the postseason as the fifth seed in the Western Conference, but they would have to win on the road in the knockout round to advance. Sebastian Blanco has had 2 extremely memorable goals in the playoffs. Portland wasn't supposed to beat FC Dallas, who has been one of the stronger teams in MLS over recent years. Previous versions of FCD have struggled late or in the postseason, but with the situation what it was, FCD was expected to advance. Portland not only advanced with a 2 to 1 win on the road, but did so after losing Lawrence Olum to a red card violation that forced Portland to play 10 men for the last 33 minutes of the match. With RSL upsetting LAFC in the other knockout round match, Portland ended up being paired with their long time rivals, Seattle Sounders FC, who had their standard summer pattern of a long unbeaten streak propel them from outside the playoffs in late June to the second seed in the West. Seattle traditionally plays strong soccer after July, and they've used this late success to win their own MLS Cup in 2016 while being traditionally a tough out in the playoffs. Portland went down a goal in leg 1 at home at Providence Park, but they responded with 2 goals to regain the lead. While Portland didn't get another goal at home, they had the 1 goal overall lead versus Seattle despite conceding a road goal to the Sounders. In leg 2, the teams played a tense first half until Seattle got a goal early in the second half to get the series draw. 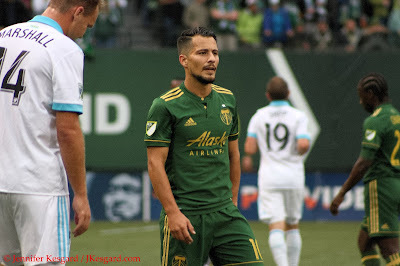 Portland still had plenty of time to respond, and a goal from Sebastian Blanco was enough to break the deadlock and put the Timbers in the driver's seat to advance, but a late stoppage goal for the Sounders forced the teams to play extra time. After trading goals through the periods, the match went to penalties and the Timbers prevailed in dramatic fashion to play Sporting Kansas City, the top seed in the West. Portland wasn't supposed to beat Seattle on their home turf in the postseason, especially on penalties. The circumstances of the match were altered because of a venue conflict, so Portland and Seattle ended up playing 4 days after the leg 1 match instead of the usual week lag time. After the victory, Portland had 2 and 1/2 weeks to wait to play SKC, who experts had tagged as the team to beat in the West. And match 1 in Portland ended up being a defensive chess match as neither side could tally a goal to give their team a lead, which put everything on what happened in leg 2 at Children's Mercy Park in Kansas City, Kansas. Sporting has a strong record at home in front of a raucous crowd, and with playing again 4 days later on the road, the Timbers weren't supposed to have a chance. In the first half, Sporting scored a goal and had 1 waived off due to interference in the box, but they were certainly dictating the tempo in the first 45 minutes. After having another goal waived off, it appeared that SKC was in complete control until Blanco struck again to level the match with a ridiculously awesome strike. Diego Valeri added another goal minutes later, and it looked like smooth sailing until the match was delayed by flying bottles from the crowd. Sporting got a goal back in the 80th minute to make it interesting, and when the officials showed 9 minutes of stoppage time, Sporting certainly had their chances to see if they could steal the result late. In the ninth minute of stoppage, Blanco was at it again by clearing a ball from danger, but Diego Chara made a wonderful run to break down the left to run it down to control and hopefully run out the clock. Valeri had shaken his mark, and when Chara saw the Maestro in open space with no defense, Chara put a pass over to him where it was just Valeri versus Sporting Kansas City goalkeeper Tim Melia. The odds were in Valeri's favor in this matchup, and when Valeri put the shot into the back of the net, it caused a massive celebration among the visiting supporters and the Timbers' substitutes. Seconds later, the final whistle blew and Portland found themselves as the 2018 MLS Western Conference Champions and qualifying for their second ever MLS Cup berth. Portland could now plot their strategy to face Atlanta, who had already qualified for MLS Cup earlier in the day; both Eastern Conference participants had a better standing in the Supporters' Shield race than either Portland or Sporting, so regardless of the result, MLS Cup would be played at the home of the Eastern Conference Champion. Since those matches back on November 29, the experts have all indicated that it would be difficult to knock off Atlanta United in their home park with all the weapons they have and a massive home crowd of support. However, Portland wasn't supposed to beat FC Dallas in Texas. Portland shouldn't have beaten Seattle in their home park. Portland wasn't supposed to run Sporting Kansas City out of their home park in leg 2 after not scoring in leg 1. Yet, Portland has done all of those things to qualify for MLS Cup. It's hasn't been pretty at points, as the backline has shown moments of inconsistent play and the offense has struggled to score during certain stretches. Portland has essentially rode the creativity and golazos of Blanco and Valeri, sprinkled with huge contributions from their supporting cast to advance, and right now, it's hard to bet against them while they are on this kind of roll. 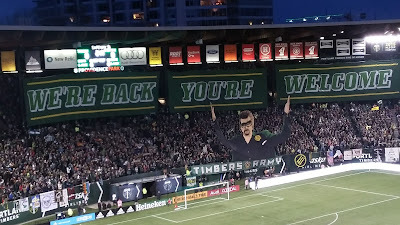 The Timbers have struggled in even year seasons - 2012 was the trainwreck that cost John Spencer his job, 2014 had a very talented Timbers club that should have qualified for the playoffs but bad results and inconsistent play kept them for achieving success, and 2016 saw the defending MLS Cup champions fail to qualify for the first time in postseason history. Portland has gone against the odds and tradition to get to this point all year, so anyone overlooking this bunch does so at their own risk. It might not be pretty, it might not work the way it's expected, and there might be mistakes along the way, but this scrappy, resourceful Portland Timbers side has done enough - and had some good fortune along the way - to get them a conference title. For me, the first goal of the match will likely be the catalyst for teams to adjust their attack, so I expect a chess match between Savarese and Atlanta United Coach Tata Martino. If Atlanta is able to score first - and they have one of the best pure scorers in the league in Josef Martinez - it will likely force Portland to counter and push to level, giving Atlanta chances to run their own counter off a turnover. If Portland can get the first goal, Atlanta could be forced to pressure even more with their numbers, and the Timbers are deadly on the counter - often absorbing pressure for long stretches until they have a chance to relieve pressure and challenge against the run of play. Atlanta loves to pressure their fullbacks forward, and that should give Portland a chance to attack wide, but they also struggle with wide pressure, and United would prefer to avoid pushing in the middle against the likely defensive midfield duo of David Guzman and Chara. Tactically, this should be a fun match to watch, but I'm expecting multiple goals on the night. My cats don't seem that interested in calling for a result, but I'm picking Timbers 3, Atlanta United 1 as my result which will give the Timbers their second ever MLS Cup. I might be tempting fate with this, but considering what Portland has done so far to get here, I'm actually in really good company.